Although Richard was losing all interest with the counterculture movement, he still wanted to give one last try to see if it did give any happiness at all. One part of Richard was retreating and questioning the basis of leading an indulgent lifestyle, yet another part of him felt a desperate need to prove to himself that he could enjoy like the others. He enjoyed but felt miserable, and saw himself fighting an inner force that was pulling him away from a life of sense gratification. “… A force within me was dragging me away from it all. Battling against that inner force, I was determined to be victorious, to experience firsthand the unrestricted pleasures glorified by society. Was it the Lord in my heart I was fighting? Yes, I silently boasted, and I’m winning the battle. But late at night, when I came back to the river, gazing down into the current, I felt ashamed. I was winning but I felt lost. During this period it was a tug of war-God was pulling Richard away from the life he knew to a life of spirituality, while his mind refused to let go the attachments to this world. For many pursuing a hedonistic goal, there is apparently no struggle of choice. For sincere seekers of truth however, the struggle with the mind is worth the effort because rich spiritual realizations come when we say ‘no’ to the lower urges and ‘yes’ to the call of conscience and prayer. Richard’s sincerity of purpose gave him a feeling of emptiness, amidst the abundant pleasures that lay before him. It is this aspiration to live our lives on God’s terms that surcharges the soul with a volcanic eruption of ecstasy. Then everything else pales into insignificance. When a spiritual aspirant endeavors to dovetail his consciousness with that of the Supreme, he lets off binding inhibitions, and instead experiences a life of unrestricted freedom. Radhanath Swami explains that a prisoner within the prison walls has restricted freedom, whereas one freed from the jail has the whole world to explore. Similarly the mind traps us with the chains of dualities- desire and hate; happiness and misery; likes and aversions. When we respond to the call of God within, we are freed from the chains imposed by the uneducated mind, and experience spiritual love. If a seeker tolerates the mind’s ramblings during this intense period, he shall soon see the mind cooperating in his spiritual quest. The Vedic scriptures reveal that God resides in the heart of every living entity as the super soul, a silent observer of our activities and desires. When we cultivate a desire to turn to Him, He immediately arranges situations to facilitate a loving relationship. Cultivating a spiritual desire removes the multiple layers of dirt from the heart, and helps us see God’s hand clearly in our lives. Amidst the thousands of confusing and contradictory voices of the mind, the call of Lord in the heart becomes clearly audible to one who seeks to serve rather than exploit. Radhanath Swami uses an analogy to make this point: A radio may simultaneously catch transmissions from many stations and as a result, the broadcast may be inaudible. As we attentively fine tune the radio, the sound is clearer. Similarly the many voices of mind make it impossible to hear the Lord’s voice in the heart. However, by cultivating the right desires and aspirations, we clear disturbances and make our heart a fit receptacle to catch God’s message of love. Truly…..only those who question today’s ways and goals of hedonistic society can inspire the youth to take to the right path…..the spirituality. I sincerely thank the author for writing this book and teaching the entire world through his own example. 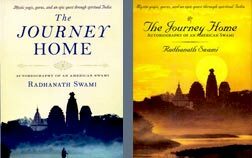 Radhanath Swami provides a vivid description of his amazing introspection in these passages. He writes “I was winning but I felt lost” ….amazing penmanship. I am very much inspired by Radhanath Swami’s realisations shared in this passage of his book, and grateful to ‘Radhanath Swami’s fan’ for squeezing even more juice from them. We are familiar with what the body feels like when it is dying of thirst. Knowingly or unknowingly, our thirsty souls are being quenched by this flow of nectar. One word came to my mind when reading this meditation, which I would like to share: CHOICE. We have free will. No one can take it away from us. It is the one thing fully under our control. What are we doing with it from moment to moment? We can use that free will to attract God’s love and mercy through our attentive love, service, and devotion…or abuse it, by misidentifying and settling for the less fulfilling gross and subtle pleasures of the body and mind. Sometimes we try so hard to convince ourselves that we are happy as we are, or that we will eventually, one day, be happy in this world through our persistent endeavours and plans. We’ll keep searching…keep trying new things and one day we’ll find it. Why should we wait? Constant happiness is the birthright of the soul. The opportunity to be happy is available NOW if we are eager to learn how to access it! But like an inheritance, it is our responsibility to claim happiness. There is a saying: ‘It is as sure as death.’ Meaning…it is guaranteed. If we CHOOSE to act in our real and natural identity of the soul, as a SERVANT of God and all His parts and parcels…happiness is guaranteed 100%. If we CHOOSE to act independently from the will and purpose of the all-loving, supremely sweet and kindest well-wisher that is God, we are guaranteed to end up confused, frustrated and unhappy 100%. Radhanath Swami once said: there must be war before there can be peace. Sometimes the truth hurts but we can ask ourselves: if for example we were eating an unhealthy diet e.g. fries and burgers every day and someone told us…you know there are alternatives; why don’t you try fresh fruit and vegetables, home-made vegetarian pastas, pizzas, soups, curries, breads and rice preparations? They tell us we will feel more energetic, experience less disease and add years on to our life. We could protest and say we have no choice but our usual diet, that we don’t need a new diet, what’s the point?! Or we could be a bit brave, admit we could be missing out on a more beneficial healthy way of living and give it a try! What is there to lose in exercising our free choice intelligently? Maharaj is like the brilliant shining SUN who can dispel all darkness in our hearts…He is like the soothing MOON who can give us shelter from the blazing fire of material existence. He is like the lovely rainfalls which can wash away our bad karmas…!! Jai Guru Maharaj..
Amazing, shows the grit of the person who is actually looking for the Supreme person. ‘Seriousness’, ‘sincerity’ and ‘no ulterior motive’ are three things which can take us ahead on path of pure devotion: says Radhanath swami..This is exactly is reflected in His own life..as seen in transparent and honest journey of his life..and that is why He has achieved Real success on path of pure devotion. This is preaching by actions…and this inspires all sincere seekers of ultimate truth. Thanx for your exemplary life, Swamiji. 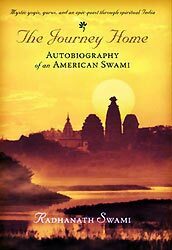 Radhanath Swami’s ‘THE JOURNEY HOME’ is breathtaking. It is such an intense autobiography of a true seeker that it has had a tremendous impact on me. And every fresh reading leaves me with new perspectives. Im eternally grateful to Radhanath Swami for sharing this heart warming story with all of us. HH Radhanath Swami is very special persone. What a wonderful thought and meditation. For most spiritualist like myself we have a hard battle to leave the unnecessary things of this world. 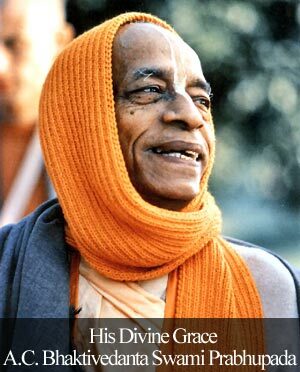 Where as great saints like Radhanath Swami had to force himself to try and see if there is any pleasure – he found none. Maharaj rightly pointed out the fact that its our free will what to do with the every passing moment in our life ,god calls us with different realisation,its on us how to understand these realisation. “The many voices of mind make it impossible to hear the Lord’s voice in the heart. However, by cultivating the right desires and aspirations, we clear disturbances and make our heart a fit receptacle to catch God’s message of love”. It is the best battle to lose – a battle which the Lord wants to win. Radhanath Swami allowed this to happen early on in his life and that is why we see him where he is today. Very nice analogy. Radhanath Swami’s life is teaching lessons at every step. Thanks a lot. “Why should I waste my life trying to fit in with the social fashions of my peers? Why not try to live on my own terms? And hopefully, someday, on God’s terms?”- Words to be meditated upon for life. Wonderful and inspiring quote by HH Radhanath Swami Maharaj “the many voices of mind make it impossible to hear the Lord’s voice in the heart. However, by cultivating the right desires and aspirations, we clear disturbances and make our heart a fit receptacle to catch God’s message of love.” Isn’t it meaningful…should remember it. Living life on god’s terms. Now that’s a wonderful choice. how true is this for Radhanath Swami Maharaj. He always chose to say ‘no’ to the lower urges, which really requires strong desire to do so. Radhanath Swami has very honestly written in his book about the dilemma going on in his mind. This episode helps us to make the right choice when we face such situations. Thank you. Yes, It is so true that Radhanath Swami felt the hedonistic way of life as a binding and thought to get free and live on own terms which may some day become God’s terms. At the same time, we need to learn that if one is not very sincere about the spiritual life but he feels that feeling of trying out various paths and methods, most probably he will land up in the shelter of some cheating way of life or so called spiritual life. That’s why this exploring thing needs so much intense desire to achieve the highest goal in life to really achieve the highest goal without being cheated. What an wonderful explanation of what our endeavour should be towards our inner calling. I find the life of an aspiring spiritualist more adventurous and fascinating than of the heroes of war or the revolutionaries. Their battles are so much tougher, and so much more significant. Thank you Radhanath Swami in motivating us to have the right kind of desires and aspirations which will help us in the service of Lord Krishna. Radhanath Swami has tried to explain that we are just like a bird which is trying to enjoy this material world without knowing that there is a closest friend of him, sitting just besides him, but he is unable to see him due to enjoying mentality. Once we turn towards this closest friend, He at once guides us to self-realization. Radhanath Swami helps us how to hear the clear voice of The Lord.All glories to Radhanath Swami. thank you for the article. I particularly liked the analogy of radio fine tuning given by to Radhanath Swami. it makes understanding very clear. Wonderful realizations! We have to be determined and choose the right path if we want to progress spiritually. Why not try to live on my own terms? And hopefully, someday, on God’s terms?”- Wonderful realization by Radhanath Swami. Hope we can try to live on God’s terms and perfect our lives. Thanks you it’s inspiring article! !